Since the termination and dissolution of Hancock & Piedfort, I have maintained a solo practice in which I am still concentrating on civil litigation and bankruptcy. The litigation includes consumer and commercial litigation with an emphasis on real estate disputes. I handle some general litigation and family law as well, and I am attempting to expand my general office practice, especially in the areas of Wills, Estate Planning, and Probate. I continue to focus on commercial and consumer litigation representing both plaintiffs and defendants, and I have some experience as a mediator. I also continue to handle bankruptcy matters for debtors and creditors. I have become Board Certified in Consumer and Commercial Law. 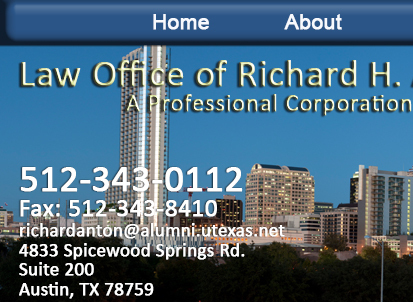 I have also taught a paralegal training course part-time for Austin Community College. I have become certified as a Guardian ad Litem for Texas courts. 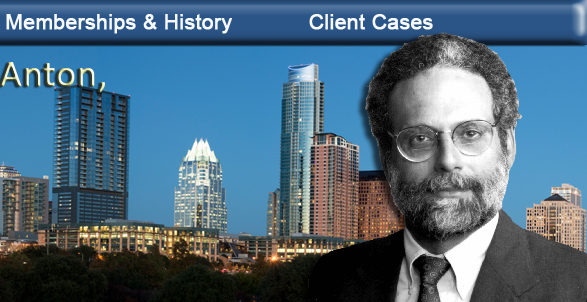 2/87 - 12/94 Shareholder in Hancock & Piedfort, Inc.
For the last few years with this firm, I attempted to limit the scope of my practice to civil litigation and bankruptcy. Most of the litigation involves consumer and commercial issues, including especially real estate disputes of various types. I handled some personal injury work and family law; my goal was to concentrate on commercial and consumer litigation, representing both plaintiffs and defendants. I have continued and will continue to handle bankruptcy for both debtors and creditors, as the economy requires. I became Board Certified in Civil Trial Law, and I initiated the certification process for Consumer Law. During this period of time, my practice varied considerably. The primary focus was civil litigation, primarily DTPA, Real Estate, and similar consumer issues, representing both plaintiffs and defendants. I continued to practice some family law and a considerable amount of bankruptcy, and I also engaged in some office practice, primarily in corporations, probate, and wills and estates. 10/82 - 12/84 Associate with Gerald H. Rosen, Kansas City, Mo. In this position I concentrated primarily on Plaintiffs' personal injury litigation, as well as employment discrimination and other civil rights litigation. I also continued to handle Workers Compensation, Social Security appeals, family law, bankruptcy, and municipal court charges. I was instrumental in automating this office by procuring state of the art word processing equipment and also assisted in designing new offices in a new building. 3/80 - 10/82 Sole practitioner, Kansas City, Mo. During this period of time, my primary practice was still in civil litigation, and I have a broader office practice, including formation of corporations and partnerships. Most of the personal injury practice involved automobile negligence, and I continued to handle landlord-tenant, employment discrimination, Workers Compensation, Social Security appeals, family law, and other civil litigation, as well as bankruptcy and municipal court charges. I managed an office comprising three attorneys including myself. This involved personnel matters, marketing, and financial operations, including meeting the payroll and regular accounts payable. 6/76 - 3/80 Associate, Koenigsdorf, Kusnetzky, and Wyrsch, Kansas City, Mo. This position involved mostly a general civil practice, with an emphasis on Personal Injury litigation representing plaintiffs. My practice included automobile accidents, products liability, medical malpractice, landlord-tenant, antitrust, Federal Energy Act claims, employment discrimination, Workers Compensation, Social Security appeals, family law, and other civil litigation. I also handled minor criminal cases, including mostly DUI charges in municipal court and some misdemeanor and felony cases in state district court. In addition I handled bankruptcy cases and some general office practice, including wills and estates. During my time with this firm, I instituted and maintained procedures for representing the Kansas City Housing Authority in landlord-tenant litigation. I also handled the trial and appeal of one of the first cases under the Federal Energy Act. 8/75 - 6/76 Teaching Quizmaster, University of Texas School of Law, Austin, TX. I was responsible for teaching Legal Research and Writing skills to a class of 25 or so freshman law students. I was selected for this position through an application process that required certain academic levels and demonstrable skills in writing and teaching. I taught the students how to do legal research and how to apply it to specific legal issues. I had to prepare and grade exams and final projects, which included a Memorandum of Law during the first semester and an Appellate Brief during the second semester. In addition I taught and evaluated the students' oral argument skills. 6/75 - 8/75 Summer Law Clerk, Brown & Bain, Phoenix, AZ. 8/72 - 6/73 Teaching Fellow, Harvard University, Cambridge, Mass. This was a part-time position while I attended graduate school. I had a class of about 20 students whom I instructed in computer programming and computer science.